These last few episodes of Agents of S.H.I.E.L.D. feel like a substantial payoff for those of us who've been patient enough through the first half of the season to stick with the show. All of those episodes spent getting to know these characters and watching them bond has built our investment little by little have, making each turn matter all the more now that the lines have been drawn. Spoilers from "Nothing Personal" ahead! "Nothing Personal" couldn't have been a less fitting title for this episode, as just about everything that happened was personal. That included the reappearance of Maria Hill, who was tracked down by Melinda May, as expected, and who later brought the U.S. military to Providence as part of a deal, which Coulson wasn't eager to take. Hill, who's now working for Tony Stark, switched sides upon learning that Ward was Hydra. That situation was a bit personal for her, since she vetted Ward. And Ward made it even more personal when he took some shots at Hill later on, telling her people lost respect for Fury when he chose Hill as his number 2, and that Romanoff would've made for better eye candy. Hill only stuck around long enough to help Coulson get Skye back, and then she was off to return to Stark industries. It took Coulson and FitzSimmons a little while to figure out what exactly happened with Ward, Skye and May. With limited surveillance footage to work with, they couldn't figure out why May left and then why Ward and Skye took off hand-in-hand on the bus. And then Simmons found Koenig's body in the storage room, and Fitz found Skye's message on the wall picture, confirming our guess last week that Skye used the city image to relay the simple message "Ward is Hydra." 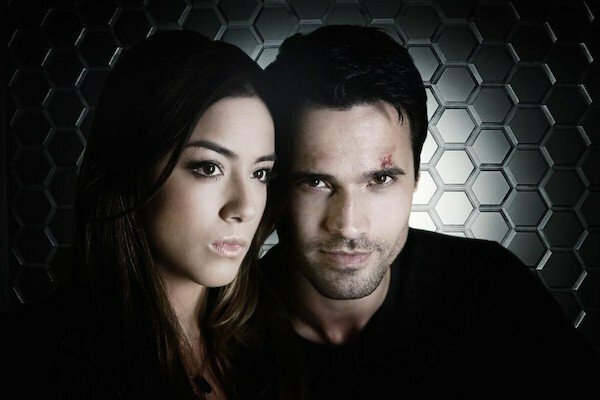 Is Ward actually Hydra though? We'll get to that. Skye impressively kept up the act that everything was fine between her and Ward while she pretended to decrypt the hard drive. But her efforts to report Ward as a fugitive and get him arrested didn't pan out. He was able to fight off the cops and Deathlok dropped in to capture Skye before she could escape. And it was at that point that Ward was no longer in control. He seems to know that now. I'm fascinated by Ward, which is something I never would have said at the beginning of Agents of S.H.I.E.L.D.. Now I find myself analyzing his every line, trying to understand exactly how far in he is. I'm still working under the theory that his loyalty is to Garrett and not Hydra. He hasn't expressed any loyalty toward Hydra specifically, and seemed to genuinely disagree with Skye when she called him a Nazi. It's almost as if he hasn't read the Hydra handbook, which he may very well not have. If his loyalty is to Garrett, then everything he's done on this "mission" has been in service to Garrett and not specifically Hydra. I thought maybe that was wishful thinking, but the preview for next week's episode suggests we're going to get to see a bit more of Ward and Garrett's history, which may help us understand why he's done the things he's done. But let's focus on tonight's episode. "Nothing Personal" had Deathlok almost killing Ward in as part of the "Plan B" to get Skye to decrypt the hard drive. When Skye outright refused to do it, Mike Peterson shot Ward with this thing that stopped his heart and refused to revive him until Skye gave up the information on how to decrypt the hard drive. Later, Mike specifically told Ward that he was just following orders, so Ward has to know now that Garrett was willing to kill him to get what was on that hard drive. If Ward's motives are emotionally driven, that may turn out to be pretty crucial when push comes to shove. Again, wishful thinking? Maybe. But I think Ward can still be redeemed. It also seems strongly suggested that Ward and Skye's feelings for one another are genuine. She wouldn't let Deathlok kill him, and Ward seemed very disappointed -- not angry disappointed, but concerned-disappointed -- when Skye outright said she'd never give them what they want. As if he knew it might cost her her life. He probably didn't guess it might cost him his, but he knows better now. Coulson managed to sneak onto the plane and rescue Skye with Lola. The group was last seen at a motel, as Fitz and Simmons swore to one another that neither is Hydra. I'll be devastated if that turns out not to be the case, but it's entirely possible one of them is. Fitz's incredibly emotional outburst could've been an act. And let's face it, there could be a dark side to Simmons we just haven't seen. But I'm honestly hoping that Ward was the sole big-twist among this group. With two episodes left though, there's room for a massive reveal. While all of this was happening, May was literally unearthing secret information about TAHITI. It's understandable that she might feel concerned over the truth behind the operation that brought Coulson back from the dead. With so many Hydra people working in S.H.I.E.L.D., anyone one of them possibly being involved with TAHITI, there's cause for alarm as it relates to what might be lurking inside Coulson's brain. As it turns out, Coulson was behind T.A.H.I.T.I. May showed him a transmission of Coulson submitting his resignation to Nick Fury, explaining that the side effects of the project -- which was being designed to be used to revive a mortally wounded Avenger if it ever came to it -- were too great and the situation was too unstable to continue. Memory wiping was the only way to curb the side effects and even that wasn't 100% effective. Does that mean Coulson could fall into a coma at any minute or suffer some other side effect? Add that to the list of things we have to worry about. But being worried is a good thing, isn't it? Caring about the outcome is crucial to a successful TV show and Agents of S.H.I.E.L.D. has finally risen to that level. With the momentum that's building, I'm confident these last two episodes will be can't-miss!